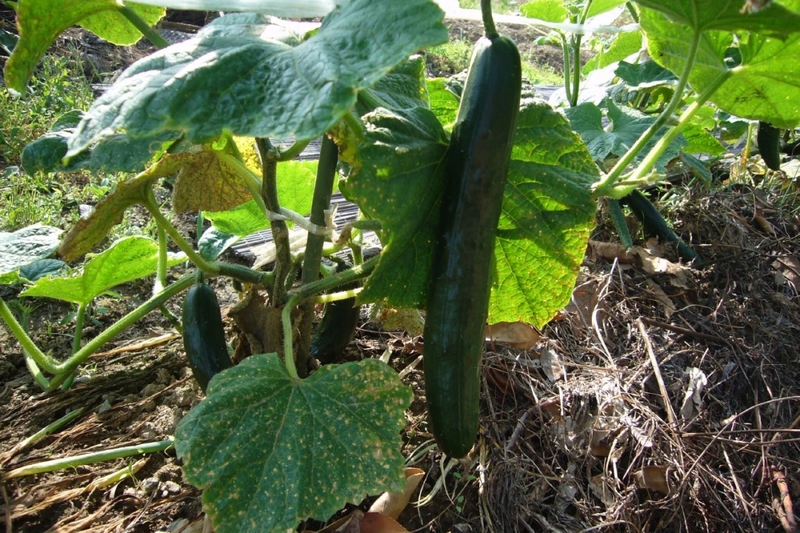 Cucumber ‘Télégraph' (Cucumis sativus 'Télégraphe'): growing, planting, caring. An excellent English heirloom variety, introduced around 1885, perfect for greenhouse production, but also good for outdoor culture. Smooth, straight, dark-green fruits, 30 cm (18”) long, with crisp and tender flesh. Grows in 60 days - with vigorous high-yielding vines. The cucumber is a creeping vine that roots in the ground and grows up trellises or other supporting frames, wrapping around supports with thin, spiraling tendrils. The leaves are palm shaped, lobed, supple and covered in hairs. The flowers are yellow and often produce green, prickly cylinder shaped fruits. Cucumbers and pickles are in fact the same plant, picked during different periods — and there are a ton of varieties, big, long, smooth skinned or not, and often very tough, like the astonishing "lemon" cucumber — a yellow and round shaped fruit! Sow under shelter or inside starting in March, in a greenhouse or next to a window, outside of direct light. Sow in seed holes with 3 seeds in each. Prepare a bed of gravel or clay pebbles to facilitate draining and prevent the roots from rotting. Add potting soil specially for sowing up to about 2/3 of the container and tamp down lightly. Then, fill up the rest of the container. It you're lucky enough to have some nice, ripe compost, use it instead of potting soil, which is bad for the environment due to transport and extraction. Water regularly. You may plan on thinning your cucumbers after two or three weeks, in order to get rid of excess plants or to eventually transplant them. Prune once the cucumber has five vines — cut the main stem after the fourth fruit has grown, and continue in the same way the the following stems. It's recommended to keep 4 cucumbers or less per vine in order to maintain optimal growth. Obviously, if you live in a very sunny region, you can let it have lots! Cucumbers appreciate regular but limited watering — let the soil dry between waterings. Also make sure you take good care not to get water on the foliage, in order to avoid diseases! Golden rule: never water during direct sunlight: this can burn the foliage, and this wastes water. Rather, water in the late-afternoon or evening, but not too late! You risk exposing your plants to mildew if the foliage stays wet throughout the night. Mulch between the plants one to two weeks after the final planting, using a natural mulch which holds in moisture. This will limit evaporation from the soil, and thus the need to water and to weed. Harvest takes places approximately three to four months after seeding, according to growth conditions. Pick the cucumbers as soon as they are fully mature to avoid stressing the plant — especially in the morning for a less bitter taste! There are number of diseases that seem pretty common among cucumbers! Mildew, unfortunately very common, causes brown marks on the leaves. Powder mildew appears with a sort of white felt on the leaves. Sodium bicarbonate will stop the formations of the fungus spores responsible for these infections! Mix five grams — one level tablespoon — of baking soda per litre of water and add one tablespoon of dish liquid, and milk or flower food, so the mixture will stick to the leaves. Spray this solution on and under the leaves, and re-apply after heavy rain. Cucumbers can be devastated by the presence of white flies. Natural remedy — you can plant them near marigolds which will drive these insects away. Once the last fruit has been harvested, you can get rid of the plants to leave space for the autumn planting! Compost the remainds, unless the foliage shows signs of disease. Starting in the beginning of May, once there's no more risk of freezing, transplant your cucumbers in open soil - rich and deep and sunny, and sheltered from the winds - keeping at least 80 cm between plants. Water thoroughly. One important note : cucumbers love heat - the more heat, the more they produce ! In fact, they will stop growing if the temperature drops below 12°C.